The 10th-generation Honda Civic diesel is the latest addition to the Honda Civic family in Ireland. With prices starting from €25,550 ex works, Honda says the new Civic Diesel is now available with a special offer for all cars registered before March 31. 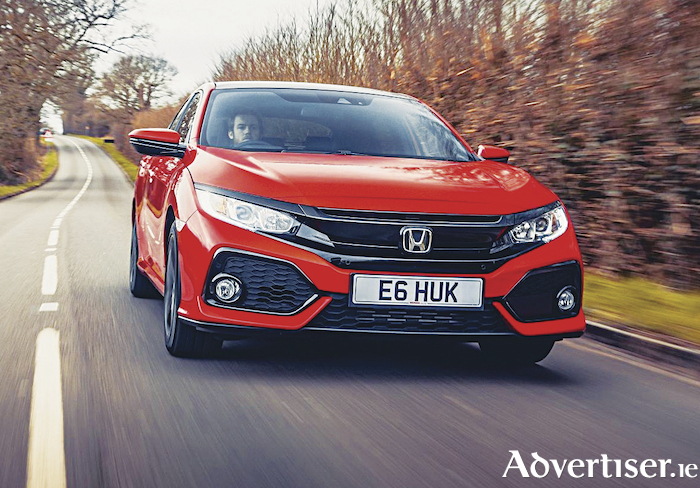 It is offering a free Honda Civic diesel service plan and one year's free road tax, and it is also available at a 3.9 per cent PCP finance rate. The new Civic 1.6 i-DTEC diesel is completely re-designed and re-engineered, and it epitomises Honda’s innovative spirit and quest for technical excellence. The result is a car created with a unique personality and sporty soul. It is exciting to drive, refined, comfortable and sophisticated. The comprehensively revised 1.6 litre i-DTEC diesel engine for the new Honda Civic range offers an outstanding combination of performance and efficiency. The development objective for this engine upgrade was to deliver an athletic response and agile feeling for the driver, greater refinement through precision technologies, and lower levels of NOx emissions. The four-cylinder 1,597cc i-DTEC diesel engine provides maximum power of 120PS (88kW ) at 4,000rpm and maximum torque of 300Nm (221 lbft ) at 2,000rpm, powering the Civic from zero to 100km/h (62mph ) in 10.5 seconds. Claimed CO2 emissions (under the updated NEDC test conditions ) are from 93g/km when equipped with the six-speed manual transmission. Combined fuel economy figures under the updated test conditions* 3.5l/100km. The improvements to the 1.6-litre diesel include enhancements to reduce cylinder friction, improve the efficiency of NOx conversion, and to further develop the driveability of the car. Honda’s engineers have employed new production processes, introduced different materials, and sourced next-generation components to deliver a comprehensively-revised engine. In line with Honda’s ‘safety for everyone’ philosophy, Honda ‘sensing’ is also available on the Civic diesel as standard. Honda ‘sensing’ is among the most comprehensive suites of safety technologies in its class. It uses a combination of radar and camera information, plus a host of high-tech sensors to warn and assist the driver in potentially dangerous scenarios. The Honda sensing suite of active safety technologies includes: collision mitigation braking system; forward collision warning; lane departure warning; road departure mitigation; lane keeping assist; adaptive cruise control; traffic sign recognition; intelligent speed; and intelligent adaptive cruise control.